Ideal for every executive and professional that needs to master the skill of service recovery and empowerment. Teaches you how to take an unhappy customer, from hell to heaven, in 60 seconds or less. When you or your organization screw up how do you save the customer from defecting and get them to believe that you are the greatest business in the world. 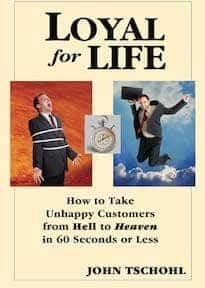 Teaches you how to take an unhappy customer, from hell to heaven, in 60 seconds or less. We believe in our products, and you will too! Every program you purchase at Service Quality Institute comes with our Lifetime Satisfaction Guarantee. Train your workforce with our programs, and if for any reason you are not completely satisfied, return the materials for a full refund. No time restrictions.